Maya is an all-in-one intuitive 3D application for modeling, rendering, and animating 3D productions. When this product was first released, it was greeted with glowing reviews from both users and the media praising its speed, comprehensive tool set, and ease of customization and extensibility. Right now, the only way to learn all aspects of this complex program is to take expensive training courses -- there is great demand for a book on the fundamentals of Maya. Digital artists are sure to appreciate Mastering Maya Complete 2. The book features a full-color insert illustrating the true effects of the techniques shown, plus a CD with 3D Gallery, a gathering of 3D rendering and animation project demos, plug-ins, and Web links to animation resources. Learning to use every aspect of Alias Wavefront's Maya can be challenging. Maya is a powerful, complex tool, but some artists devote themselves to using only one or two features, like modeling, particle animation, lighting, or animation. 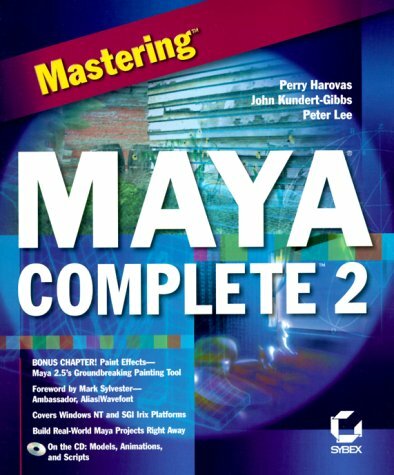 The authors of Mastering Maya Complete 2 have tried to cover every aspect of the program within this book, and the result is a balanced overview of the entire program that lays a solid foundation for anyone climbing the Maya learning curve. The book contains six major sections: fundamentals, modeling, animation, Maya's scripting language, rendering, and advanced Maya effects. Individual chapters delve into the details of Maya's feature set, mostly with tutorials demonstrating their use. Sidebar tips appear on almost every page, and the authors have made liberal use of screen shots. The opening chapter sets the tone for this voluminous book as an introductory tutorial to building a complete scene. A simple model is created and textured, lights are added, and the model becomes animated and rendered. While this section isn't heavy on detail, the project is complete and offers a whole overview of the Maya project cycle. The rest of the book covers features like the modeling tools, animation tools, and advanced effects in greater depth.